Shopping can be difficult for transgender and non-binary teenagers. Some cannot afford clothing, while others can feel uncomfortable or fearful of shopping on the ‘wrong side’ of the store. It’s an issue that Nick Johnson, IB Diploma Programme (DP) student at Signature School in Evansville, Indiana, USA, knew too well. 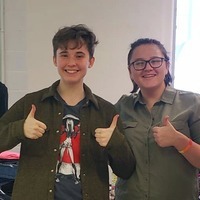 This is why he and classmate Emme Lang created The Rainbow Jacket Project as part of a Creativity, Activity, Service (CAS) project – it’s the first LGBTQ+ clothing bank the area. The goal is to create a safe and validating space for teenagers while providing gender-affirming clothing and accessories. Clothes are donated to The Rainbow Jacket Project from people in the local area and other schools. Years later, when he heard a transgender classmate mention that they didn’t have clothing that matched their gender, he realized that this problem was more widespread and thought about how he could help. “I have devoted so much time and energy to this project – creating something that didn’t exist before, and then promoting it throughout the community,” says Nick. “I have never stopped feeling incredibly proud and happy with what I am doing, and I enjoy all of it. Nick and Emme are constantly thinking of new ways to try and grow this project and will be hosting an art competition in June for ‘Pride’ month. “Many small LGBTQ+ groups in Evansville have reached out to us and offered to help. We are banding together to create something big – a very positive change for Evansville. We still have lots of outreach left to do, especially among youth, so I expect the response to be heightened in the coming months,” says Nick. LGBTQ+ is based on the following terms: lesbian, gay, bisexual, transgender, queer, questioning, intersex and asexual people.